Once in a while a collector will come across something that not only catches their attention but also causes a great emotional response. Such is the case at least with me with this bizarre green California Clubhouse Whiskey. For those of you who don’t know or maybe just not care about western whiskey cylinders, and for those who collect and delight in the acquisition of them, the California Clubhouse stands at the very top of the western fifth food chain. In John Thomas’ iconic book on western whiskeys, Whiskey Bottles of the Old West, his survey of 50 of the best western fifths begins with the Clubhouse. That’s both in his own desirability list and a survey of collectors. Number one among western whiskey collectors. That’s saying something. The Clubhouse is desired for a number of reasons. Even a non-whiskey collector can appreciate the amazing amount of embossing, which runs from top to bottom, with the elaborate monogram in the middle, maybe the largest and most impressive monogram on any western bottle. 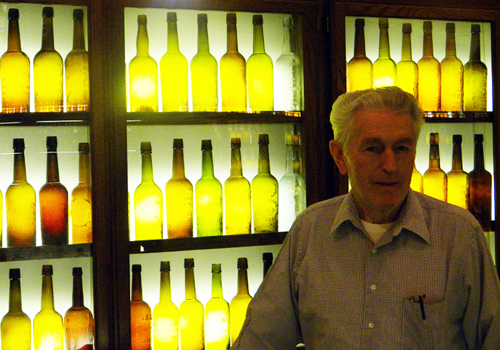 In addition, the name of the wholesaler, John Morrison himself is a player in the annuals of western whiskey lore. His wholesale whiskey business started in 1866 on Front Street in San Francisco. His association with another top western whiskey, the Kentucky Gem is discussed on page 10 of Thomas’ book and is quite interesting if not a little confusing. Morrison’s bottles were made for only two years starting in 1872 and he was apparently known as a connoisseur of fine sprits. As Thomas writes in his book, Morrison would buy whiskey based on the ship the casks were on. It was thought that the sailing ship that had endured rougher seas on their trip around the horn held a better quality whiskey due to the constant rocking of the casks in the cargo hold. His brand, Blue Grass Whiskey distilled by E.J. Curley & Co., arrived on the “…ships Kingfisher and Moonbeam, the choicest lot in the market, four summers old,” it was reported. 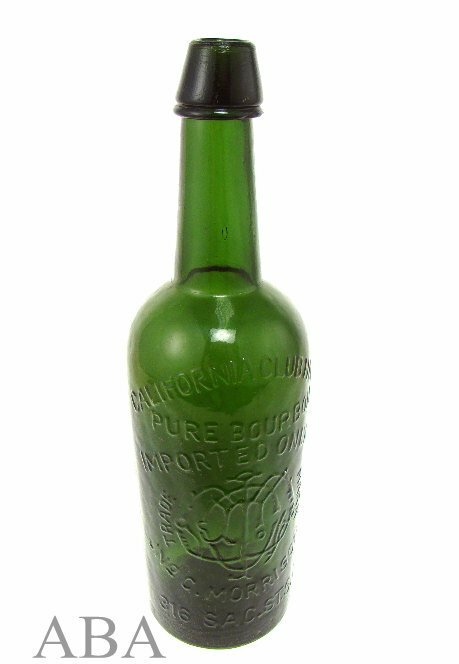 The bottle itself reads California Clubhouse Pure Bourbon Imported by Jno C. Morrison 316 Sac. St. S.F. along with the rather large monogram. The lettering in the monogram appears to be a CC and JM in combination and I suppose it could be interpreted in a few different ways. So where did this bottle come from? Why the drastically brilliant green coloration? It is thought that there are around nine different Clubhouse examples known according to Thomas’ new book, published after his death. That would be six in amber, one in olive amber and two pure green examples. The green examples aren’t a mistake like other western fifths. They were meant to be green. The reasoning is that when you see a green Clubhouse, it is pure green, most greenish western fifths are a result of aqua or another color being in the pot and adding amber. So what differentiates this green one with a real one? Well this example is not any sort of green you’d see in a western fifth, not even a pure green example. This is not even a green that you’d see in any embossed western fifth. Why? The bottle they used was to old to start out with. And frankly, it’s a tangible figment of someone’s imagination. This bottle is a reproduction, or bottle made by someone, possibly in the 1970’s, to either fool a buyer or made for the fun of it. The problem is that sometimes the person, who creates it as a type of “whimsy,” sells it to someone who’s not so honest and they in turn sell it as a real antique. It’s happened with a number of different items including shot glasses, insulators, marbles and other bottles. In fact, we believe that whoever made this example made others. This particular example was passed off to a collector in the 1970’s as being genuine. A real antique. From what we understand it wasn’t cheap either. If the buyer had taken some time and really looked at the bottle, they would see first of all that it has a replaced neck. Right at the base of the neck you can see where it was cut, using a very thin blade, and replaced with a new neck, almost identical in color. Next, we took a blacklight into a very dark room and the entire body of the bottle lit up. So, knowing that there were bottles made years ago with just the embossing applied, we knew that this was either their work or someone who actually brought it up a notch and frankly did a very good job. It appears they took a mold of an original Clubhouse and made a resin copy. They then took the entire piece of resin, possibly in a semi-molten state and wrapped it around the bottle. Since the entire bottle lights up under a black light it’s apparent someone was very careful to prepare it in a way that instead of just letters being applied, the entire surface of the bottle was applied, thereby making it appear more realistic. The discernable distractions or “creations,” of this particular bottle are the replaced neck, and the wrong neck, the resin, and of course the color. Regarding the neck and top. The neck used is from an older bottle than you’d expect to see on a real California Clubhouse. Genuine examples have a very uniform neatly made top. This example is from a much earlier bottle and in fact it’s crooked. Another dead giveaway. There’s no way an embossed western fifth would’ve come in that color; at least we’ve never seen one. So a list of things told us it was a fake. Not to mention it’s just…too much! Item’s like this are still out there, just look how this one came out of the woodwork. It came from an old collection and although it’s a copy or fake, it is still a marvel to look at. Bottle lore as one collector pointed out. If someone really wanted to produce a fake, they’d be better off sticking with a more standard color and certainly not replace the neck. If there are examples out there in collections today, they most likely have gone the way as the others with the resin aging and falling off the bottle. In this case, a close inspection reveals numerous factors that it is a fake. I almost purchased some marbles, sulfides that I found to be fakes. They were blue and amber and surely would fool an amateur collector. But knowing how rare colored sulfides I had to ask myself if it’s possible they could be “not right.” Although I don’t think we’ll ever need to worry about fakes in the hobby of bottle collecting, repairs and tinkering with damage has become an art. With new resins that don’t glow under black light, the ability to create a resin repair that is almost invisible even with a black light is a scary thought. Bottle cleaning has advanced to a degree, which far excels cleaned bottles from years ago. Nicks, dings, scratching, small chips and tiny fractures are all fair game. Buying a bottle without a loupe and blacklight, in a bright area is now a no no as small, expertly “conditioned,” damage has taken on a life of it’s own. Most collectors are honest and they will be happy to tell you if there’s been anything done. But if a piece passes hands more than once, that information can often be left behind and although if a tree falls in the forest does anyone hear it rule can apply, most collectors would rather buy the real deal than a plastic surgery look alike. Just take your time, there’s always another deal around the corner. If you suspect something question it. And remember also, that just because there’s a mark on the top or something on the bottle that looks buffed or different, it doesn’t mean it’s been messed with. We’ve seen a number of sodas and other bottles come straight out of the ground with a top you’d swear was buffed. It happens. Most of all, enjoy what you’re doing. Buy what you like, not what you think is going to go up in value. It’s like buying a painting you don’t’ really like but think is going to increase in value. Do you really want to look at that hideous thing in your living room because you think it’s going up in value? Buy quality and what you like and you can’t go wrong in this wonderful hobby of bottle collecting. And don’t forget about marbles.